Our book is finally in print! Check out "The Complete Anchoring Handbook," published by McGraw Hill's International Marine Division! This book aims to be user friendly without being nerd hostile. Its target audience consists of technically-minded navigators who want to understand in plain language the physics of anchoring along with state-of-the-art, practical how-to advice.. 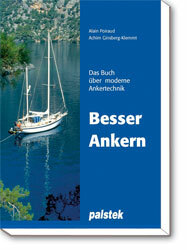 While cruising, Achim co-authored "Besser Ankern," published in German by Palstek Verlag in Hamburg. In May 2005 we completed a remarkable transatlantic journey, this time with our new homebaked crew, and certainly plenty of other visitors aboard. You can relive the crossing by clicking on "Latest." By September 2005 we settled in Sarasota, FL, where Antonia went to Kindergarten. January 2006, Maeva Margarita was born on the sailboat, between the motor hatch and the chart table. If you've never been to Pangaea's website before, I recommend clicking on "Earlier" to get to our pre-baby cruising days, since it's filled with non-diapery adventures and gives you a feel for what we might be pitting ourselves against now that we are underway with the kids.